Stromboli  is a small island in the Tyrrhenian Sea, off the north coast of Sicily. 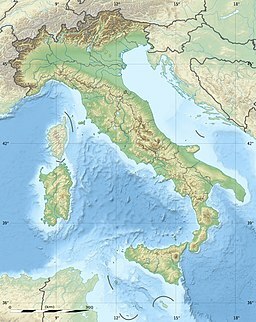 It has one of the three active volcanoes in Italy. Stromboli is one of the eight Aeolian Islands, a volcanic arc north of Sicily. The volcano has erupted many times and is constantly active with minor eruptions, often visible from many points on the island and from the surrounding sea. This gave rise to the island's nickname "Lighthouse of the Mediterranean". The most recent major eruption was on 13 April 2009. Stromboli stands 926 m (3,034 ft) above sea level, and over 2,700 m (8,860 ft) on average above the sea floor. There are three active craters at the peak. A significant geological feature of the volcano is the Sciara del Fuoco (stream of fire), a big horseshoe-shaped depression generated in the last 13,000 years by several collapses on the northwestern side of the cone. Two kilometers to the northeast lies Strombolicchio, the volcanic plug remnant of the original volcano. ↑ 2.0 2.1 "Stromboli". Global Volcanism Program, Smithsonian Institution. http://www.volcano.si.edu/world/volcano.cfm?vnum=0101-04=. Retrieved 2009-01-01. ↑ Tibaldi A. et al 2009. Subaerial-submarine evidence of structures feeding magma to Stromboli Volcano, Italy, and relations with edifice flank failure and creep. Tectonophysics, 469(1), 112-136. This page was last changed on 13 February 2017, at 13:56.